When it comes to charging your new Tesla vehicle, nothing is more convenient than charging in the comfort of your own home! If you’re reading this, you’re probably either dreaming of your new electric vehicle or you’ve recently purchased one. When you get your new Tesla, it comes with a charging cord and adapters that you can put on in order to use the different types of chargers. When it comes to charging your new Tesla vehicle, nothing is more convenient than charging in the comfort of your own home! So, if your Tesla is “riding on empty” and you’re going to have to let it charge for that full twelve hours, wouldn’t you like to do that at home? Well, if you’d like a Tesla charger on your property, call TriStar Electric today! Our Tesla-certified technicians can help you choose the charger that’s right for you. 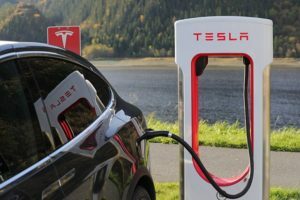 Once installed, you will be able to charge your Tesla from the comfort of your own home! This entry was posted on Friday, November 9th, 2018 at 3:42 pm. Both comments and pings are currently closed.